Pinan Yondan, the fourth of the Pinans. Much of the kata appears to be related to attacking the elbow joint. Turn to the left into nekoashi-dachi or in the Heian variants kokutsu-dachi. Beginning with both hands near the right hip, raise the right arm to head height with open hand and bent 90° elbow. In the Heian variant this is done slowly to indicate resistance. The left arm is raised to shoulder height, also bent 90°. This is kaisho haiwan-uke. Drop both hands quickly below shoulder height and simultaneously turn clockwise 180°. Different styles drop the hands different distances, some to the hip, some to just below shoulder height. The Heian variant goes to the hip. Turn to the right into nekoashi-dachi or in the Heian variants kokutsu-dachi. Beginning with both hands near the left hip, raise the left arm to head height with open hand and bent 90° elbow. In the heian variant this is done slowly to indicate resistance. The right arm is raised to shoulder height, also bent 90°. This is kaisho haiwan-uke. Turn 90° anti-clockwise to the front and drop both arms to the hips, bring the left towards the right side of the body. Execute juji-uke strongly as stepping forwards into zenkutsu-dachi with the left foot forwards. Execute morote-uke strongly with the right hand and foot forwards. Simultaneously step forward into kokutsu-dachi (back stance). Bring your back leg up to your right into heisoku-dach. Simultaneously bring your left hand across your body into koshi-kamae. Turn 90° anti-clockwise and kick with mae-geri. The Heian variants don't turn, and use yoko-geri instead. 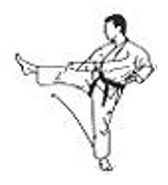 Drop the kicking left leg down into zenkutsu.dachi and execute mawashi-empi-uchi with your right arm. Bring your back leg up to your left into heisoku-dach. Simultaneously bring your right hand across your body into koshi-kamae. Turn 90° clockwise and kick with mae-geri. 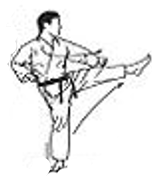 Drop the kicking left leg down into zenkutsu-dachi and execute mawashi-empi-uchi with your left arm. Turn 90° anti-clockwise into yoko-seishan-dachi. [Heian version] As you turn execute a shuto gedan-barai with your left arm and a shuto age-uke with your right. [Pinan version} use hidari-harai-te (left hand sweep) which is less obvious than the shuto-gedan-barai and shuto age-uke. [Pinan version] Left hand shuto age-uke and right hand teisho-uke or nagashi-uke at jodan level. [Heian version] Left hand shuto age-uke and right hand jodan mawashi shuto-uchi. Execute mae-geri to the front. Execute otoshi-uraken-uchi with the right hand. Continue the uraken-uchi with the right hand and pull the left hand to the hip with hikite. [Pinan version] Turn anti-clockwise 225° into neko-ashi-dachi with left leg forward and execute uchi-ude-uke with the left arm. [Heian version] Turn anti-clockwise 225° into kokutsu-dachi with left leg forward and execute double block with both left and right arms. Kick mae-geri with right leg. Punch oi-tsuki with the right arm, and leg forward. Pull the left arm to the hip with hikite. Punch gyaku-tsuki with the left arm. Pull the right arm to the hip with hikite. [Pinan version] Turn clockwise 90° into neko-ashi-dachi with right leg forward and execute uchi-ude-uke with the right arm. [Heian version] Turn clockwise 90° into kokutsu-dachi with right leg forward and execute double block with both left and right arms. Kick mae-geri with left leg. Punch oi-tsuki with the left arm, and leg forward. Punch gyaku-tsuki with the right arm. uchi-ude-uke to the front in nekoashi-dachi with the left arm and leg forward. [Heian variant] morote-uke to the front in kokutsu-dachi with the left arm and leg forward. Some styles use uchi-ude-uke and some use morote-uke. uchi-ude-uke to the front in nekoashi-dachi with the right arm and leg forward. [Heian variant] morote-uke to the front in kokutsu-dachi with the right arm and leg forward. Raise both hands to around head height then bring them down sharply. Typically they are closer together than in the image used. Bring your right knee up in a hiza-uchi. Turn 180° anti-clockwise as you step down. [Pinan variant] Turn 45° to the left and execute shuto-uke in nekoashi-dachi with left hand and leg forward. [Heian variant] Execute shuto-uke in kokutsu-dachi with left hand and leg forward. [Pinan variant] Turn 45° to the right and execute shuto-uke in nekoashi-dachi with right hand and leg forward. [Heian variant] Execute shuto-uke in kokutsu-dachi with right hand and leg forward.